On July 11th, 1958, Daisy Bates and the Little Rock Nine received the 43rd National Association for the Advancement of Coloured People (NAACP) Spingarn Medal for upholding the ideals of American democracy. Since 1915, the Spingarn Medal has been awarded annually by the NAACP to recognize the highest achievement in the past year by an African-American. The award has been given to notable figures which include Richard Wright (1941), Martin Luther King (1956), Rosa Parks (1979), Maya Angelou (1994), et. al. The history of the Little Rock Nine begins in September of 1954, when the Brown vs. the Board of Education ruling of the U.S. Supreme Court declared segregation in American public schools unconstitutional. Met with much resistance, the court decided to declare that public schools needed to be integrated “with all deliberate speed.” In Little Rock, Arkansas, integration of the school systems began in 1957 with the city’s Central High School, where it encountered an overwhelming amount of resistance from segregationist councils. In 1955, Virgil Blossom, the superintendent of the Little Rock school system, created a plan to superficially comply with integrating the Little Rock schools. Although Blossom’s plan staged integration in Little Rock schools, it prolonged it until 1963, garnering negative reactions from the NAACP. Blossom’s plan allowed students to attend schools out of their zoned district so that high schools could end up with a concentrated either white or black population, thereby complying with segregationist ideals. The plan gerrymandered Little Rock’s school districts; it warranted a black majority at Horace Mann High and a white majority at Hall High. In 1956, the NAACP filed a lawsuit against Blossom’s Plan and urged quicker integration in Little Rock public schools, which gave way to the Little Rock School Crisis of 1957. The first phase of Blossom’s plan was integrating one high school. Called the “Little Rock Nine,” Ernest Green, Elizabeth Eckford, Jefferson Thomas, Terrence Roberts, Carlotta Walls LaNier, Minnijean Brown, Gloria Ray Karlmark, Thelma Mothershed, and Melba Pattillo were enrolled to the previously all white high school, Little Rock Central High School in September of 1957. The students were chosen based on academic excellence and determination by Bates, head of the NAACP chapter in Little Rock, and also known as the “First Lady of Little Rock.” Bates was known as a spearhead figure in how vigorously she fought to integrate schools in Little Rock. Presently, the NAACP hosts the Biennial Daisy Bates Summit to assess progress in education for people of color. Prior to their attendance at Central High, Bates encouraged that the Little Rock Nine be given counseling sessions on how to handle the expected violence from their white schoolmates. The students’ preparation before their attendance proved to be necessary because on their first day, they were faced with segregationist crowds that forcibly blocked their entrance to the school. The next day Governor Orval Faubus issued the Arkansas National Guard to support the segregationists. 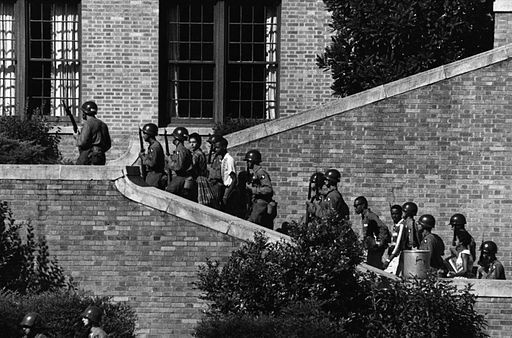 Photographs of soldiers blocking out the Little Rock Nine to this day carry a powerful message about how racism is embedded in U.S. history and represent the polarization of the nation in crisis. On September 24, President Dwight Eisenhower sent federal troops to deescalate the situation and enforce the integration of the nine students. From 1957-58, the nine students faced immense racism from various students at Central High. One of the students, Patillo (later Beales), later published a book, Warriors Don’t Cry, about all of the verbal and physical abuse she faced attending school at Central High, incidents which include having acid thrown at her face while in school and being trapped in a bathroom stall while having flaming paper thrown at her from overhead. Faubus continued to resist integration in Little Rock in hopes to prolong his term in office and gain votes. In 1958, he decided to petition the Federal District Court and argued for a two and a half year delay on integration of Little Rock schools due to the violence it would incite. After much deliberation and petitioning, Faubus signed acts that closed all of Little Rock’s public schools, winning a vote against integration 19,470 to 7,561. The year that followed is now cited as “The Lost Year.” During this year, blacks in the area faced countless threats as racists and segregationists blamed them for the school closings. In 1959, Little Rock Central reopened with integrated student bodies, but were still met with racism and regression. All of the Little Rock Nine went on to achieve meaningful careers. In 2009, they were invited to President Barack Obama’s inauguration. The Little Rock Crisis of 1957 continues to be a key event in Civil Rights history and is especially important as a guiding light for promoting civil rights today.